After more than a decade in the making, Lucile Packard Children’s Hospital Stanford recently opened the doors to its new state-of-the-art building. At 521,000 sq. ft. (48,402 sm), the new building depicts California’s diverse ecosystem and natural beauty, with each floor representing a native eco-region. In a press release announcing the opening, the hospital describes the new 149-bed facility as being designed to transform the patient and family experience through nature and play. Its founder, the late Lucile Salter Packard was a known advocate for treating both the patient and their family, not just the illness. 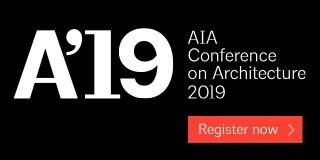 With this in mind, lead architect Robin Guenther, a principal with the architectural firm Perkins + Will in association with Hammel, Green and Abrahamson, Inc. and Mazzetti, set out to fulfill Packard’s vision by designing one of the country’s most sustainable children’s hospitals. The new 149-bed facility as being designed to transform the patient and family experience through nature and play. To bring to life two mosaic tile themes representative of California’s seashore and the Redwood Forest, international award-winning mosaic artist Gary Drostle and his company, UK-based Drostle Public Arts, created and installed 19 hand-cut mosaics using Winckelman Unglazed Porcelain, a set of bronze medallions and 700 hand-cast glass leaves to be set in a specially-designed terrazzo floor. 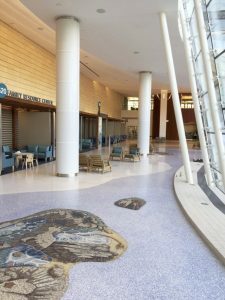 After nearly two years of craftsmanship, Drostle’s designs were installed in the ground floor lobby area of the hospital and first-floor central corridor using LATICRETE® products. 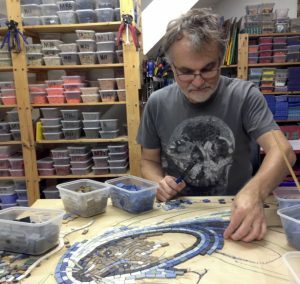 International award-winning mosaic artist Gary Drostle and his company, UK-based Drostle Public Arts, created and installed 19 hand-cut mosaics using Winckelman Unglazed Porcelain, a set of bronze medallions and 700 hand-cast glass leaves to be set in a specially designed terrazzo floor. 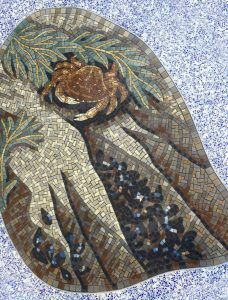 The new hospital features mosaic tile designs representative of California’s seashore and the Redwood Forest. 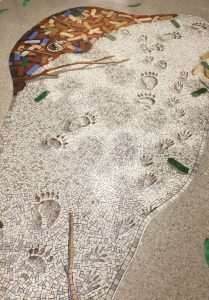 As the former president of the British Association for Modern Mosaic and a regular teacher and juror at the Society of American Mosaic Artists, Gary Drostle brought more than 30 years of experience of creating large-scale public mosaics for floors with him to the jobsite. 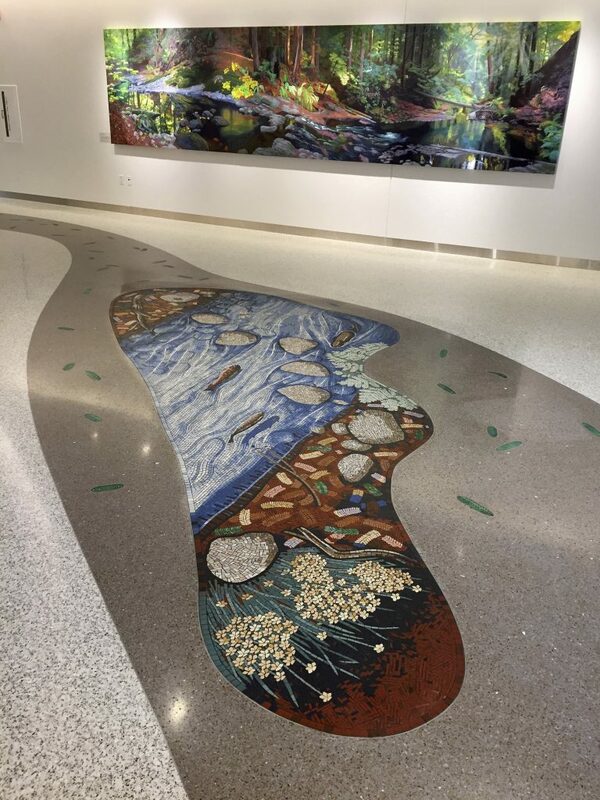 After nearly two years of craftsmanship, Drostle’s designs were installed in the ground floor lobby area of the hospital and first-floor central corridor using LATICRETE® products. Interference: Installing fine hand-cut mosaic is always a challenge due to the tolerance required in the setting of the work. 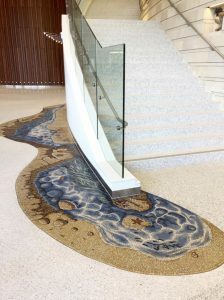 To make this installation possible, Drostle and his team needed the specified LATICRETE products to deliver superb bond strength that would hold the adhesive bond between the mosaic sheet, while retaining a good open time for the slow and precise mosaic tile adjustments. 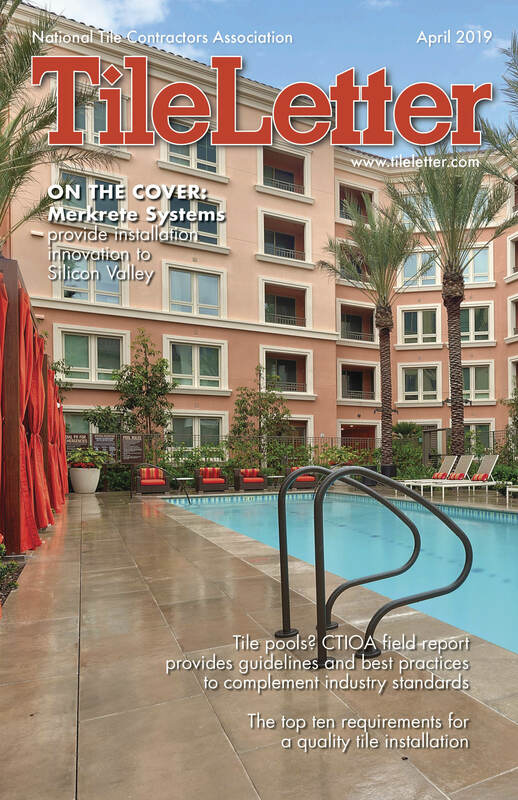 Timeline: The tile work for Lucile Packard Children’s Hospital Stanford needed to be completed speedily on a jobsite with many other contractors demanding the same workspace. Products used needed to be formulated with rapid-curing properties to meet efficient timelines. 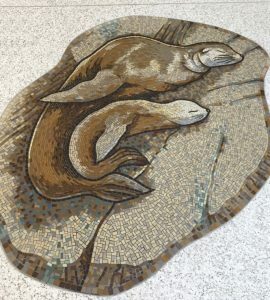 Once on site to begin the mosaic panel installation, Drostle Public Arts’ installation crew applied NXT® Level, a cement-based underlayment for use in leveling interior substrates, on the ground floor lobby area and first-floor central corridor. 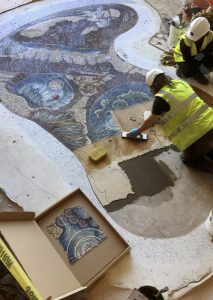 Once on site to begin the mosaic panel installation, Drostle Public Arts’ installation crew applied NXT® Level, a cement-based underlayment for use in leveling interior substrates, on the ground floor lobby area and first-floor central corridor. This product was selected to produce a flat, smooth and hard surface for the finished mosaic tile installation. Once cured, NXT Level is durable, fire- and heat-resistant, non-combustible, non-sensitive to moisture and maintenance-free, making it optimal for use in a healthcare facility. To adhere the 19 mosaic panels to their respective flooring areas, 254 Platinum was specified for its superior strength and bond. To adhere the 19 mosaic panels to their respective flooring areas, 254 Platinum was specified for its superior strength and bond. 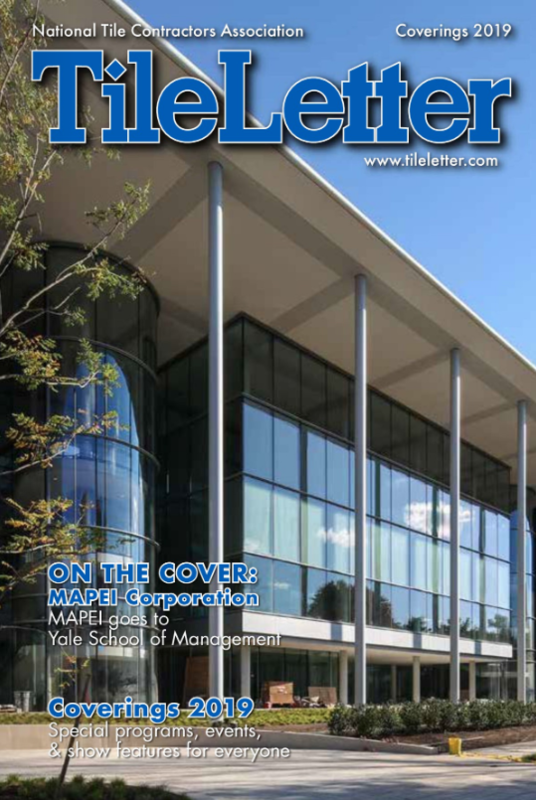 Designed for a simple install, the one-step, polymer-fortified mortar only requires water for mixture and has a long open time for enhanced workability. PERMACOLOR® Select, an advanced high-performance cement grout that offers the industry’s first dispersible dry pigment solution, was used to grout all of the mosaic tile installations. 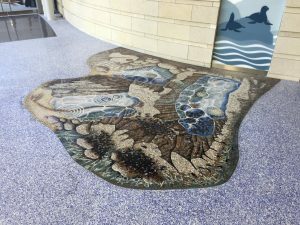 With PERMACOLOR Select, Drostle Public Arts gained increased productivity and time savings on the jobsite, thanks to a faster time-to-grout and foot traffic permitted in as little as three hours. To add a pop of color, the team opted to use a PERMACOLOR Color Kit for a glossy Raven tint. PERMACOLOR® Select, an advanced high-performance cement grout that offers the industry’s first dispersible dry pigment solution, was used to grout all of the mosaic tile installations. 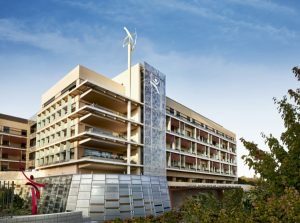 In April of this year, Lucile Packard Children’s Hospital Stanford announced that its new main building was awarded LEED Platinum status, the highest designation for sustainability recognized by the U.S. Green Building Council. Thanks to the architectural prowess of the Perkins + Will, Hammel, Green and Abrahamson, Inc. and Mazzetti team and leadership from the hospital, Lucile Packard Children’s Hospital Stanford is one of just five hospitals in the world – and only the second children’s hospital – to achieve LEED Platinum certification. Lucile Packard Children’s Hospital Stanford is one of just five hospitals in the world — and only the second children’s hospital — to achieve LEED Platinum certification. 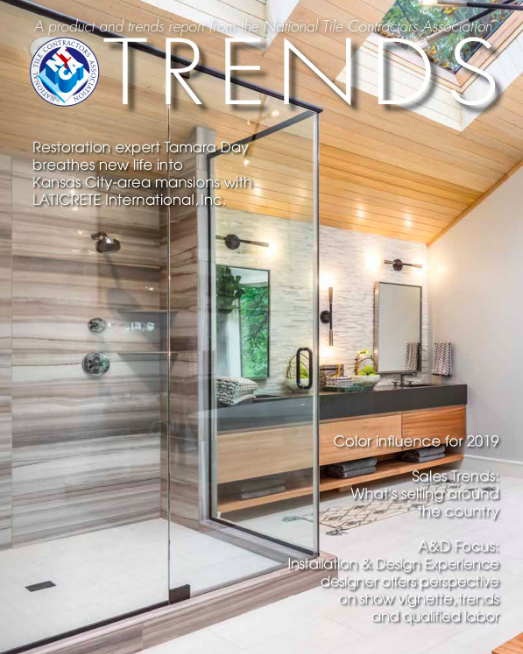 “For each portion of our mosaic tile work, there was an appropriate LATICRETE product to ensure a lasting installation and bring the ‘wow’ factor with a pop of color in the grout,” said mosaic artist Gary Drostle.